Garages, for better or worse, are not just the structures we park cars in; they inevitably become overflow storage areas for out of season or seldom used items from our homes. 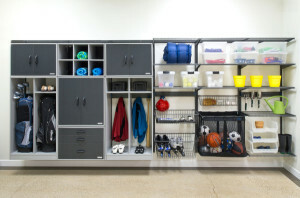 The most efficient garages absorb this function in stride, are still able to provide useful work spaces and accommodate the family vehicle; but how many of us can really claim to have a well-organized garage? Most of us despair of ever imposing order in these spaces; there are always projects with higher priorities that need to be done in our limited spare time. 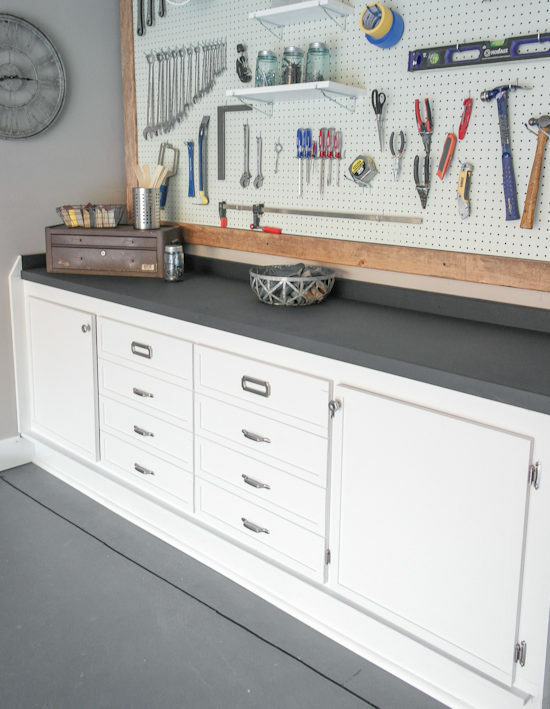 Well today we focus on DIY garage workbench ideas and feature a workbench transformation that will blow your mind and hopefully inspire you to get started! Sisters Jodie and Paige over at sypsie.com took on a one-day-one room challenge to clean up and reorder their garage. The results: showroom worthy! 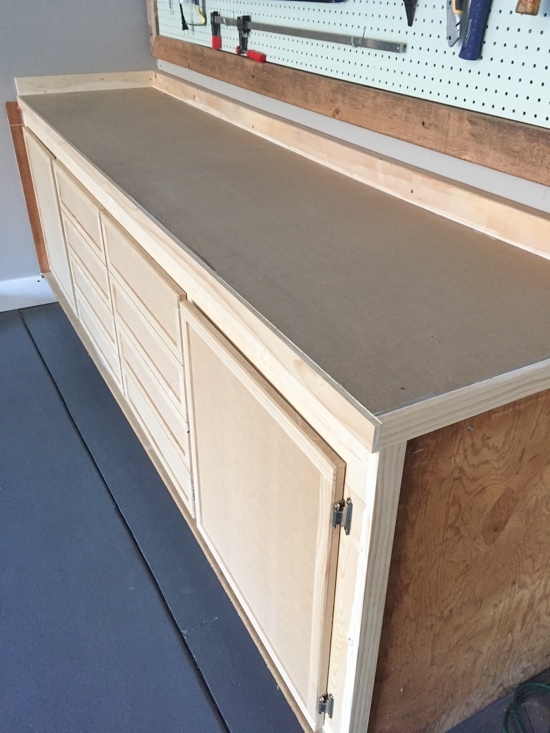 When Jodie and her husband Matt moved into their 1979 colonial fixer-upper they inherited a half finished workbench in the garage. 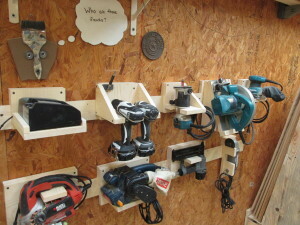 The bones were good, but the open-faced storage space soon became a repository for all the usual odds and ends: automotive accessories, gadgets and hardware: spare oil and filters: gardening tools and paint. The poor tired old bench quickly turned into a huge eyesore. 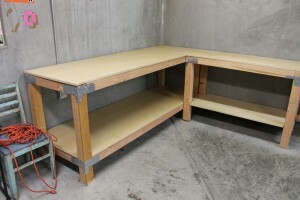 The pair soon realized that what they really needed was a diy garage workbench idea that hid away all the clutter and which would facilitate organization not detract from it. 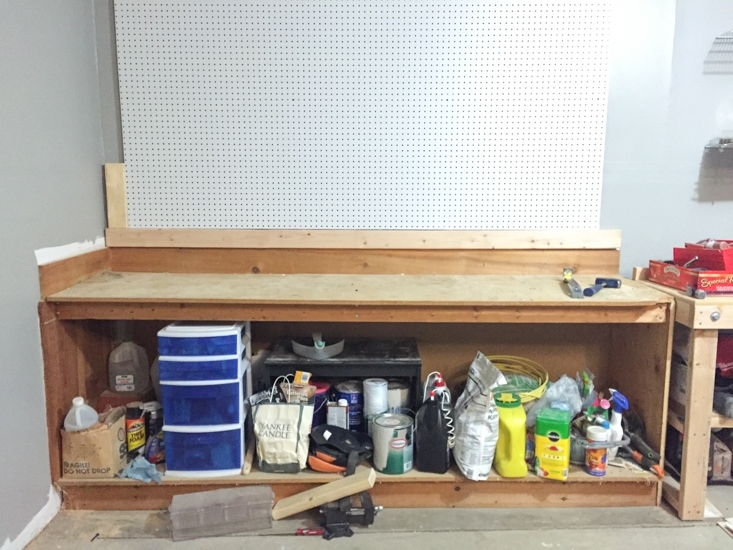 When they decided to renovate the workbench, they discovered that some of the wood, including the top and some 2 x 4’s, needed to be replaced and that the structure itself needed reinforcement to stand up over the long haul. Preserving the basic frame of the old bench would make the project cost-effective so they made repair and reinforcement their first priority. The ultimate goal was to add doors to the bench so that the unsightly insides would finally be a thing of the past. This required the addition of a frame for the doors being added to the front. Next they tore out the old bench countertop, placed a piece of particle board over the open top of frame to add some necessary height and overlaid that with medium density fiberboard (good old MDF!). Once the countertop was in place they dressed up the raw edges with lattice trim and iron-on veneer. Next came the four doors which they crafted from more MDF dressed up with more lattice trim. To add visual interest without sacrificing storage, they added even more trim pieces and hardware pulls create the illusion of drawers on the two center doors. All that then remained was the painting. They coated the front, doors and side with two coats of white gloss paint, then added four coats of blackboard paint to the counter surface. This not only created a visually striking contrast, but was highly practical as well. Jodie can use a piece of chalk to jot down measurements or sketch out ideas on the surface top whenever inspiration strikes and then easily wipe away the evidence of her brainstorming after finishing the project. 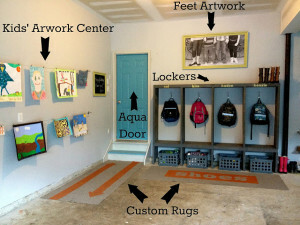 How to Organize A Garage For a Real Family!